John Gibbons never had to worry much when Roy Halladay was on the mound. Until it came time to take his star pitcher out the game, anyway. Gibbons, who managed the late Halladay from 2004 to 2008, remembers a specific game against the Boston Red Sox in which he pulled the two-time Cy Young winner after eight innings, replacing him with closer Miguel Batista, even though Toronto had a substantial lead. "Batista goes in there and then all hell breaks lose," Gibbons recalled with a smile Thursday, hours before the Blue Jays retired Halladay's No. 32 in an emotional ceremony before their 6-1 opening day loss to the New York Yankees. "I think the game ended with a smoking line drive to centre field, we caught it but the go-ahead run was on base. We got out of it and we're shaking hands and I said to Roy: 'I'll never do that again, trust me,' and if I remember correctly he just said: 'Don't worry about it.' But I learned my lesson. Halladay died last November when the small sport plane he was piloting crashed into the Gulf of Mexico. He was 40. The towering right-hander quickly became a fan favourite in Toronto, where he spent 12 of his 16 major league seasons. Halladay won the American League Cy Young with the Blue Jays in 2003 and took the NL award with the Phillies in 2010, his first season in Philadelphia. He signed a one-day, free-agent deal with Toronto in December 2013 to retire as a Blue Jay. 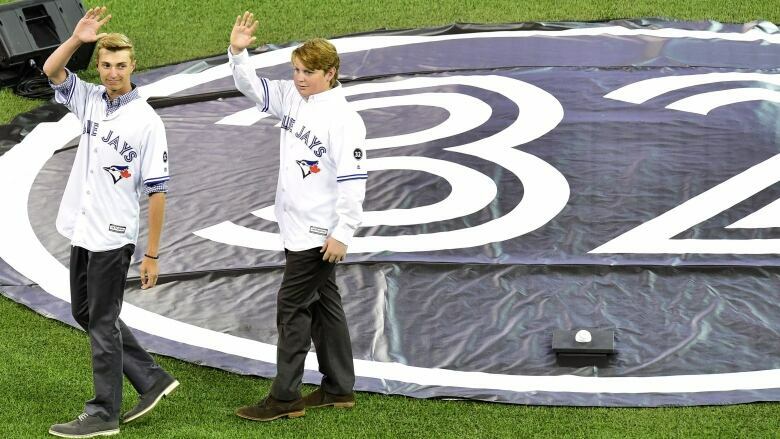 The club returned the favour Thursday, enshrining him on the Rogers Centre's Level of Excellence and unfurling a No. 32 banner from the centre-fielder rafters to thunderous applause. 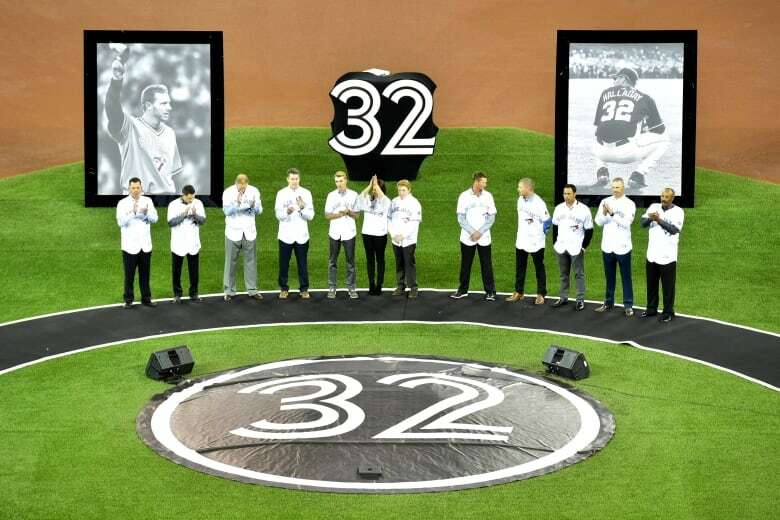 A large, round, black-and-white 32 decal was laid flat on the mound for the pre-game tribute while four black-and-white photos of Halladay, taken at different points in his Blue Jays career, stood on the infield. The first photo showed Halladay with his wife Brandy and two sons, Braden and Ryan, who were on hand for the ceremony wearing white No. 32 Blue Jays jerseys. Former Blue Jays players Pat Hentgen, Paul Spoljaric, Paul Quantrill, Scott Rolen, Jose Cruz Jr., Jason Frasor and Chris Carpenter and former manager Cito Gaston were also part of the ceremony. Each embraced Brandy, 17-year-old Braden and 13-year-old Ryan before taking their places alongside them on the field. Gibbons presented Halladay's sons with a gift from the organization before a video tribute was shown on the centre-field scoreboard. The video began with touching words from former teammates as well as players with the Calvary Christian High School baseball team, where Braden plays. Halladay helped coach Calvary Christian to an undefeated 2017 season and a state championship. There was no ceremonial first pitch. Instead, the game ball was placed on the mound by Braden and Ryan. 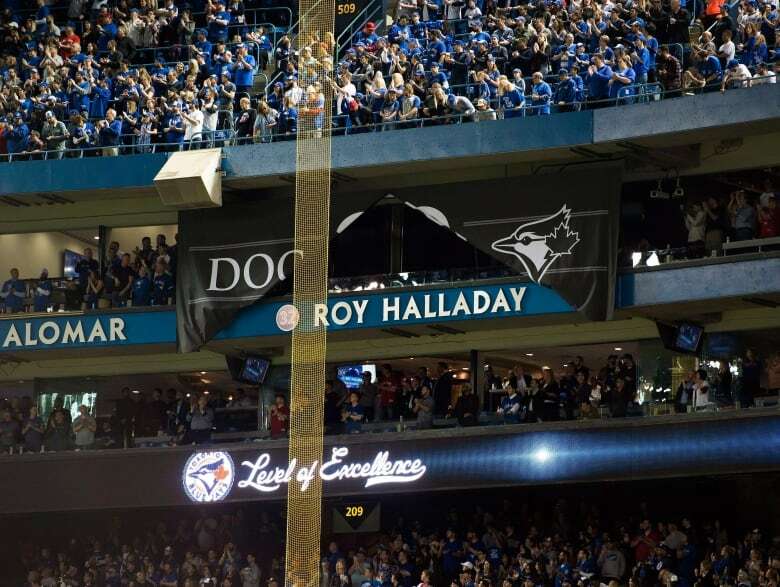 Halladay's number is only the second to be retired by the Blue Jays. Hall of Famer Roberto Alomar's No. 12 was retired in 2011. All Toronto players will wear a commemorative No. 32 patch on the left sleeve of their uniforms this season. While he never won a World Series, Halladay came closest with the Phillies and pitched a no-hitter in his first post-season start on Oct. 6, 2010. "I remember thinking that no-hitter was incredible," new Toronto reliever and Canadian John Axford said last week. "Being a Blue Jays fan, seeing how hard he worked, and this team wasn't able to have the playoffs come to fruition for him. So I remember that moment [the no-hitter] and being so happy for him. "Even though it wasn't the team I wanted to see him do it with, it was something he had been waiting for his entire career and he had worked so hard for it and when he got it he took full advantage of." "He wasn't afraid of anybody, and he wasn't a guy that I would want to face, that's for sure," added Blue Jays second baseman Devon Travis. "It just shows that this life, every single day you better appreciate it. "Even the great ones can be gone in an instant."